This is a great way to use old pieces from your wardrobe and update them for a new look. For my project, I used a crew neck cardigan that is fairly light weight and has a nice tight weave to it. 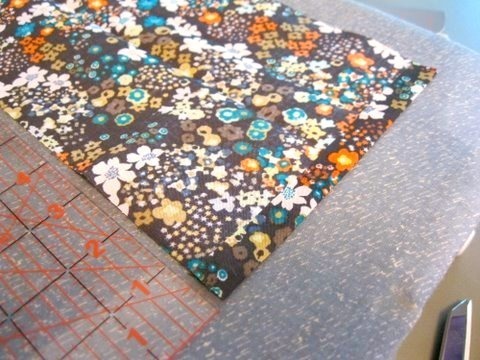 I chose fabrics from my scrap pile to bind the cut edges with. I hope you find creative uses to adapt this project to fit your own fabrics and sweaters! Cut the front of the sweater straight down the middle. Be sure to measure so that your line is straight and even. 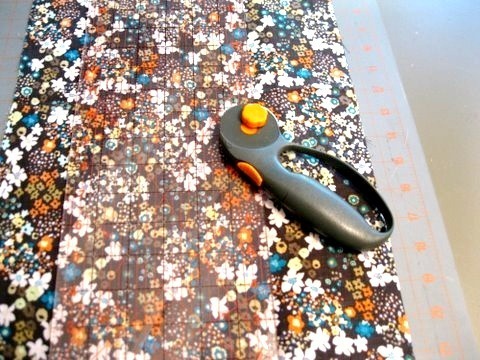 Cut with a rotary cutter. 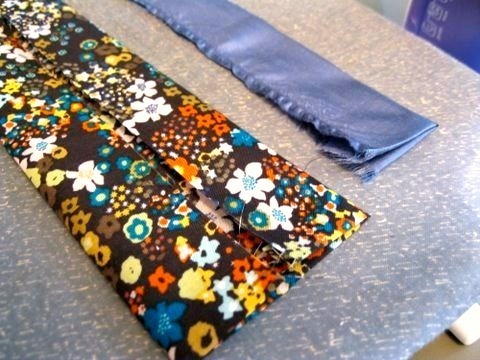 Choose a main fabric to bind the cut edges. I chose a quilting weight fabric left over from another sewing project. 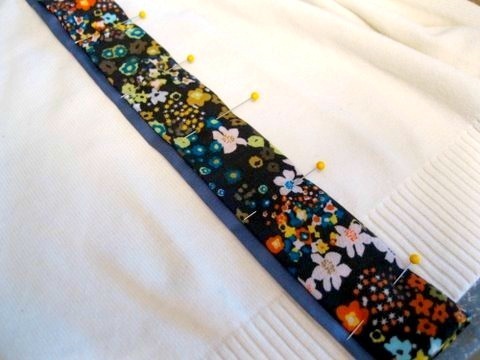 Cut two fabric strips 6″ wide by the length of the cut edge of the cardigan plus 1″. 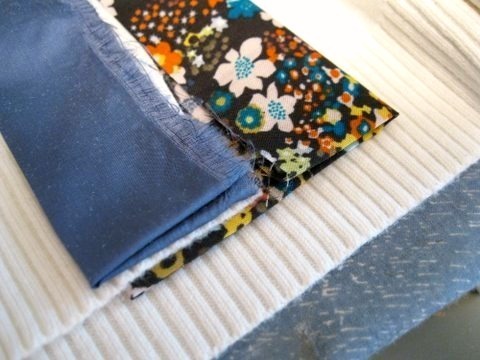 For example, the front opening I cut in my cardigan measured 19.5″, so I cut two fabric strips measuring 6″ x 21.5″ each. Choose a coordinating accent fabric, if desired. 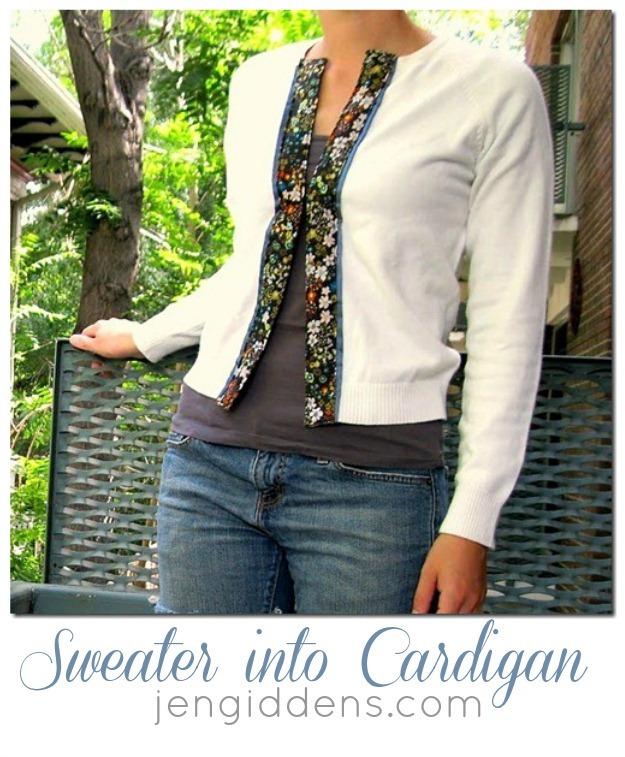 Cut two fabric strips 3″ wide by the length of the cut edge of the cardigan plus 1″. 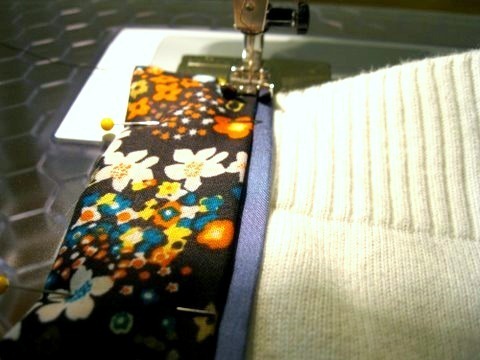 Press the short ends of the main fabric under 1/2″. Fold in half lengthwise and press. Now fold the raw edges to the center and press again. For the coordinating fabric, press the short ends under 1/2″ and fold and half lengthwise and press. Now position the cut edge of the sweater inside the fold of the main fabric. 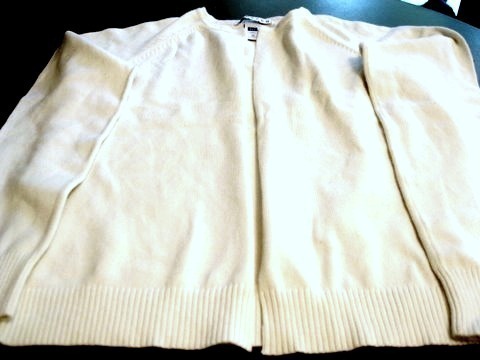 Position the coordinating fabric on top of the sweater, with the cut edges aligned along the cut edges of the sweater. You may slightly adjust the coordinating fabric to allow for more or less fabric peeking out from underneath the main fabric. Pin all of the layers in place every couple inches to keep the fabrics from shifting as you sew. Repeat for other cut sweater edge. Now topstitch along all four edges of the main fabric piece. I chose to use a 1/8″ seam allowance, but a 1/4″ allowance will also work. Repeat for the other bound sweater edge. If desired, you may use one or two hook and eye closures to keep the cardigan semi closed as you wear it. There are so many fun variations that you can do for this project, like using ribbon instead of fabric, replacing the coordinating fabric with lace, or layering an additional coordinating fabric. 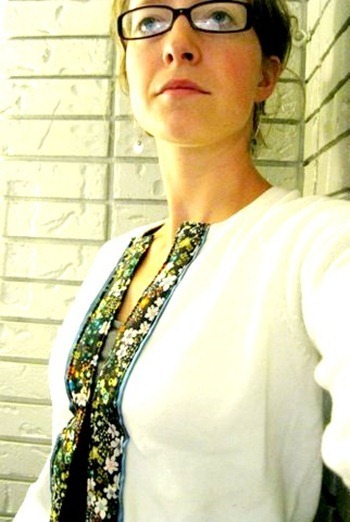 Make sure to stop by Jen Giddens website and blog to see many of her beautiful patterns and tutorials!! Next Post: My Houndstooth Quilt…Finished! Wow, that is easy! I will have to grab up some plain sweaters on sale and transform them! thanks for sharing. Love it!!! And that black fabric is one of my favs from the fat quarter section at Joann’s. Great job!!! Really adorable – that extra coordinating color makes it so charming and more sophisticated! Love this! What a great way to give a face lift to two cardigans I hardly ever where anymore – I think I’ll wear them now. Very nice cardigan! I like the idea, I was searching one to change one of my sweater into a cardigan, I’ll use yours!